U.S. economy paints a rosy picture, buoyed by an 18-year high consumer confidence, increasing consumer spending and strengthening labor market as well as higher business investments and government expenditure. A favorable GDP growth rate further inspires optimism. Per the Bureau of Economic Analysis, second-quarter 2018 GDP expanded 4.2% in its second estimate. This marks an improvement from 4.1% growth reported in July and 2.2% expansion in the first quarter. Positive trends in the economy are driving many U.S. industries, including the Retail – Discount Stores industry, which currently dwells amongst the top 34% (86 of 256) of all Zacks industries. Robust omni-channel initiatives — including technological updates and store remodels, solid brand enhancing efforts with off-price models and innovative customer-friendly approach have been acting as propellants for the industry. In addition, cost-containment endeavors, coupled with pricing and promotion strategies, are catalyzing growth. However, higher investments toward technology advancements and stiff competition in the industry play spoilsports. Additionally, heightened online competition from e-commerce giant Amazon AMZN, on parameters such as same-day delivery and pricing, further remain threats. Nevertheless, the Retail-Discount Stores industry surged 46.4% in a year, cruising ahead of its sector’s rally of 31.6% and the S&P 500’s growth of 18%. Impressively, there are stocks those are putting up a stellar show buoyed by the trends in the booming space. We have handpicked stocks like Burlington Stores, Inc. BURL, Target Corp. TGT and Dollar General Corp. DG, among others. In fact, all three stocks have hit a 52-week high on Sep 5. 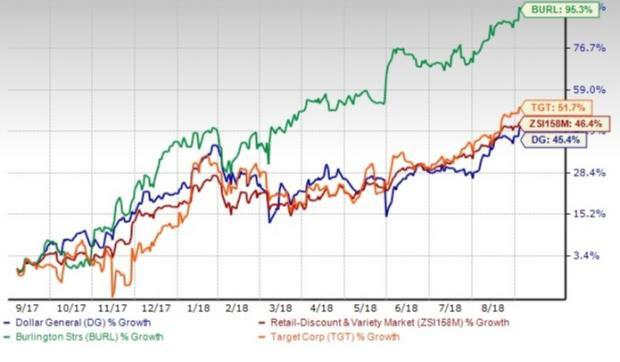 Interestingly, shares of Burlington Stores and Target have been rallying ahead of the industry, soaring 95.3% and 51.7%, respectively, in a span of a year. Moreover, both the stocks presently flaunt a Zacks Rank #2 (Buy). While any stock can see a spike in price, a real winner continuously outperforms the industry and the broader market. Though shares of Dollar General have gained 45.4% in the same time, it marginally underperformed the industry. Dollar General currently carries a Zacks Rank #3 (Hold). While Target boasts a VGM Score of A, Burlington Stores and Dollar General have a score of B.
Let’s examine the stocks individually. Shares of Burlington Stores scaled a 52-week high of $175.48, closing the session lower at $172.87. We note that the company has made multiple changes to its business model to adapt to the ongoing changes in the industry. In fact, its current “open to buy” off-price model is helping customers to get nationally branded, fashionable and high quality as well as right priced products. Its long-term strategies include the enhancement of assortments, with the primary focus on underpenetrated categories — particularly home and beauty — to make business less-weather sensitive. Moreover, it is gradually expanding its store fleet. As a result, the company has been doing well on both earnings and revenue fronts. It has posted earnings beat in 19 consecutive quarters. Further, its revenues have outpaced estimates in eight of the last 10 quarters and shown constant improvement over the past few quarters. Comparable store sales (comps) have also remained sturdy in recent years, marking the 22nd straight quarter of comps growth in second-quarter fiscal 2018. Gross margin has also shown constant improvement in the last five years. Shares of Target hit a 52-week high of $89.42, closing a notch lower at $88.60. Management is trying all means to rapidly adapt to the changing retail ecosystem. The company remains committed to enhance omni-channel capacities, introduce new brands, remodel or refurbish stores, and expand same-day delivery options to accelerate the shopping process. In addition, it teamed up with popular online grocery delivery service Instacart, rolled out Target Restock program and more. Further, the company made significant headway in the same-day delivery race by acquiring Internet-based grocery delivery service, Shipt, to provide same-day delivery of groceries, essentials, home, electronics and other products. Also, Target focuses on developing flexible and smaller format stores to penetrate deeper into urban areas. The company has surpassed revenue estimates for the sixth straight quarter, thanks to higher comps and number of transactions as well as strong traffic growth. Moreover, its earnings have outpaced the Zacks Consensus Estimate in two of the trailing four quarters, delivering an average beat of 1.3%. Management also raised its earnings per share guidance to $5.30-$5.50 for fiscal 2018, up from $5.15-$5.45 guided earlier. The consensus estimate for the fiscal is pegged at $5.37. Shares of Dollar General also touched a 52-week high of $111.36, though it closed a tad lower at $111.06. Better price management, cost containment, private label offering, effective inventory management, merchandise and operational initiatives are the key cornerstones for the company’s success. Dollar General is focusing on both consumables and discretionary categories, and items, ranging between $1 and $5, to boost traffic. In fact, the rollout of tobacco has been a key factor in driving up traffic. Furthermore, it is expanding its cooler facilities to enhance the sale of perishable items, and is rolling out DG digital coupon program and DG Go app. Dollar General’s comps growth story is impressive as fiscal 2017 highlighted the 28th consecutive year of growth for the company. Also, it posted solid results in second-quarter fiscal 2018. However, any deleverage in SG&A rate, owing to higher labor expenses, occupancy costs and utilities expenses, might impact margins. Nevertheless, management expects net sales growth of 9-9.3% for fiscal 2018 versus growth of 9% guided earlier. Earnings per share are envisioned to be $5.95-$6.15 compared with the Zacks Consensus Estimate of $6.09. In fact, the estimate moved north 2 cents in the last seven days.